BB Cream Reviews | May our skin grow beautiful, as we grow wiser. May our skin grow beautiful, as we grow wiser. Tina was one of the 3 winners in the SkinCeramics and Beaute Derm BB Cream Giveaway ( all three were from the United States ) . 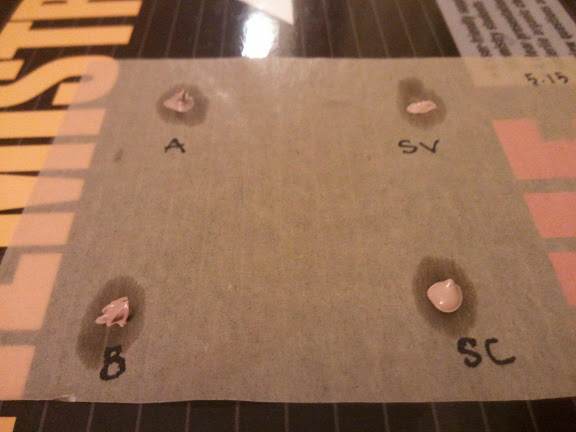 She was also the only one who received the BB Cream out of the 3. The other 2 BB Creams got stolen on the way. Without further ado.. here is Tina’s Review on the BB Cream. 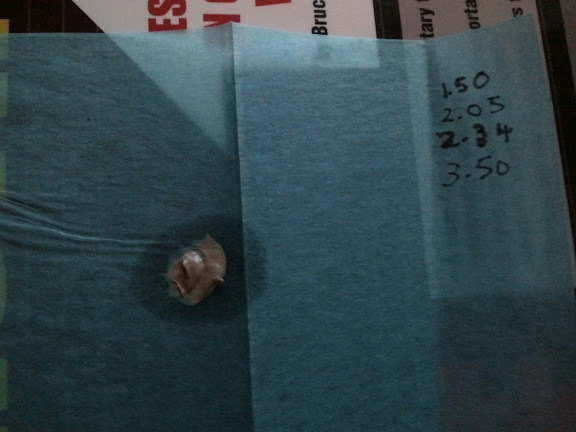 Hope In A Blog hosted a small giveaway, the prize being a sample size of Skin Ceramic BB Cream. I won on the condition of writing a review on this product. My review of this product is completely honest and all opinions are my own. 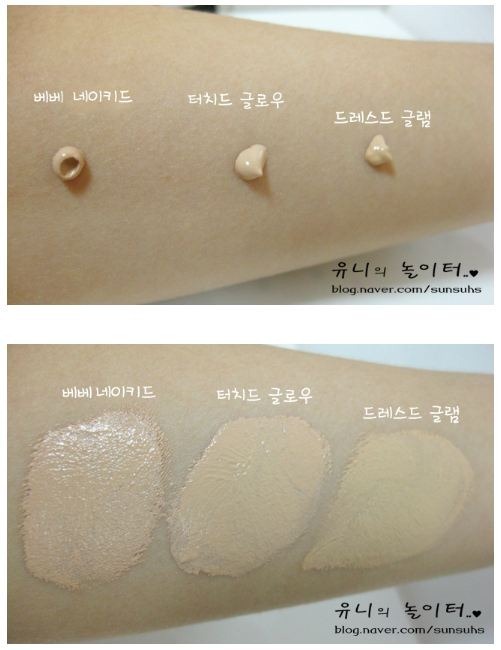 What it is: Skin Ceramic is a Korean brand of BB cream. Unfortunately, their website is in Korean and my Korean is not good enough to translate what I’m reading. The bottle states: “regeneration skin, wrinkle treatment, oil control, long water, long wear. 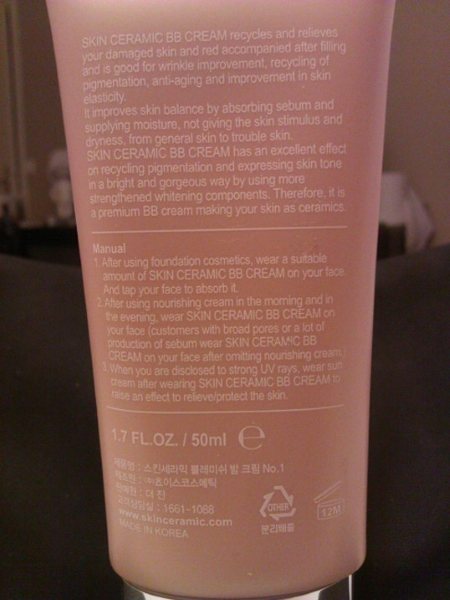 This BB Cream is for your skin as ceramics.” For a full list of ingredients, click on their website here (ingredients are listed in English as well as Korean). 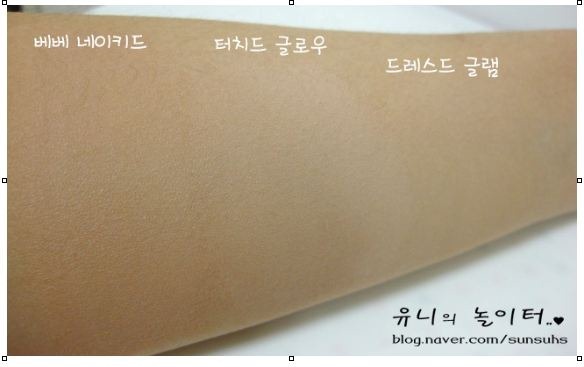 Hope In A Blog claims it’s a higher-end BB cream but I am not able to confirm this because I don’t know the price or where to buy it. Texture and color: The texture reminded me of Estee Lauder Double Wear Light and it is unlike my other BB creams. It’s thinner and not as creamy as my other BB Creams (read about my hunt for my favorite BB cream here). 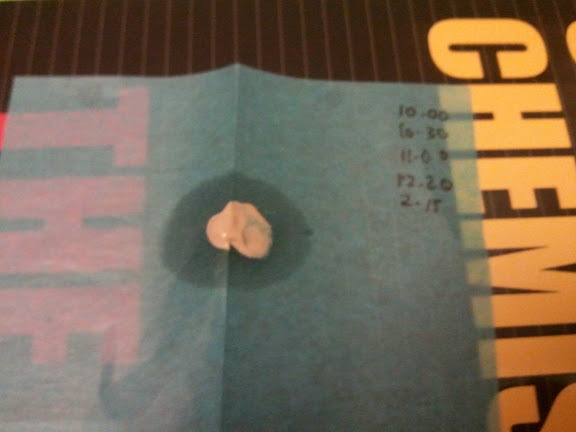 It has a light chemical-y paint-y kind of smell to it, typical of some liquid foundations. The smell isn’t particularly pleasant but it’s not off-putting either. The color is surprisingly not grey-based like most BB creams. 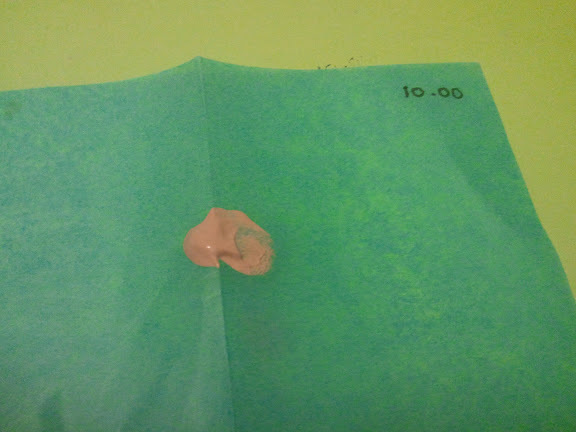 It is very light and has a strong pink undertone to it. My experience: I tried this twice before deciding that I wouldn’t wear it anymore. 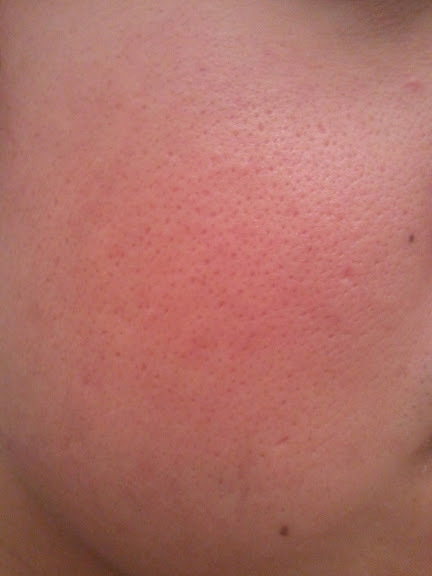 The first day I applied a light layer after I moisturized my face then set it with MAC’s Mineralized Skin Finish Natural. There was hardly any coverage, none at all actually. When I wear BB creams, I like to dab a little extra underneath my eyes to help neutralize my undereye circles and usually that works for me. 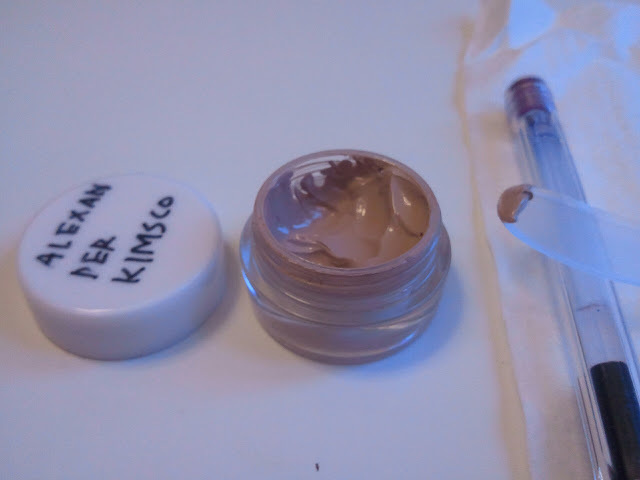 With Skin Ceramic, however, the coverage was so sheer that putting extra underneath my eyes did absolutely nothing. The overall finish was okay but then I thought, maybe my MAC powder made it look better. 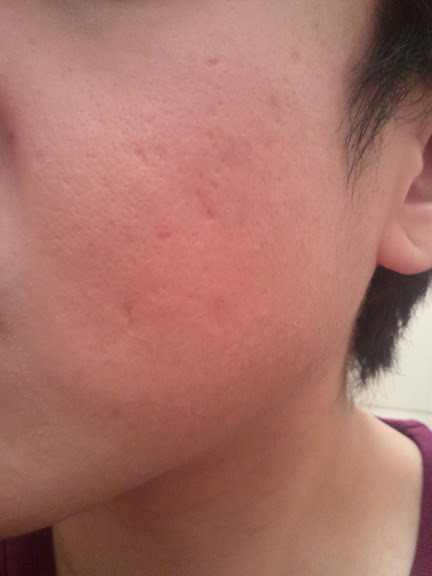 Therefore, the second day I applied just Skin Ceramic BB Cream without setting it. The color is so pink that it didn’t look good on me at all. It changed the tone of my face and it wouldn’t match my neck. 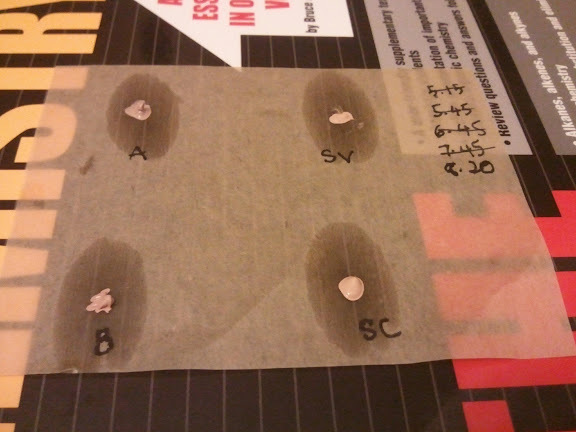 Skin Ceramic adds pink color without providing any coverage whatsoever. 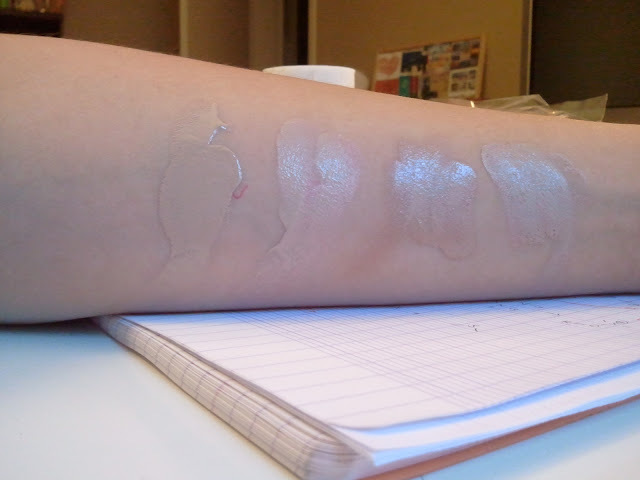 It does oxidize enough to match my NC30 skin tone but the pink undertone really ruins the overall look. 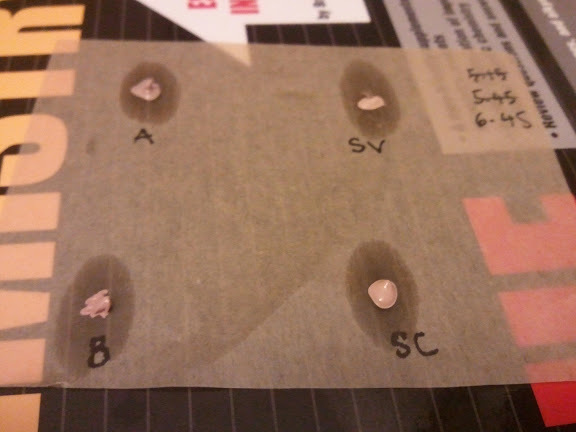 I eventually set it with MAC’s MSFN because I wanted to neutralize the pink as much as possible. For reference: I wear NC 30 in MAC Studio Fix, B30 in Chanel Vitalumiere Aqua, 32 in Make Up For Ever Face & Body, 127 in Make Up For Ever HD Foundation. 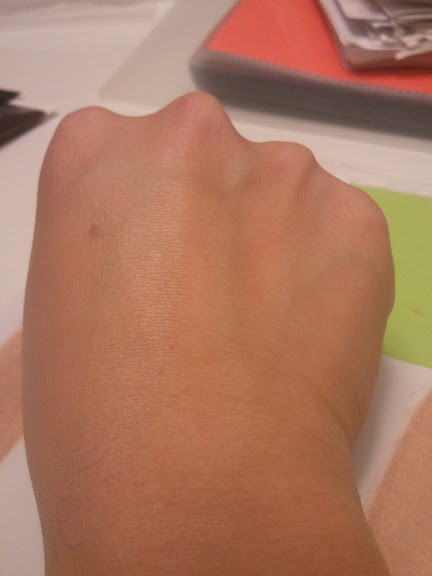 My skin is on the lighter end of “medium” and I have yellow undertones. Conclusion: I do not like this BB cream at all. I cannot speak for its wrinkle treating properties as I would have to wear this for a while but my opinion is based on its color and lack of coverage. I don’t need much coverage but this miraculously provides NO coverage but it adds color, the wrong color for me I might add. This may work for fair Caucasians who have pink undertones. I don’t personally know any Asians who have pink undertones. If you think the color would match you and if you have oily skin, I think Skin Ceramic would be good for you. 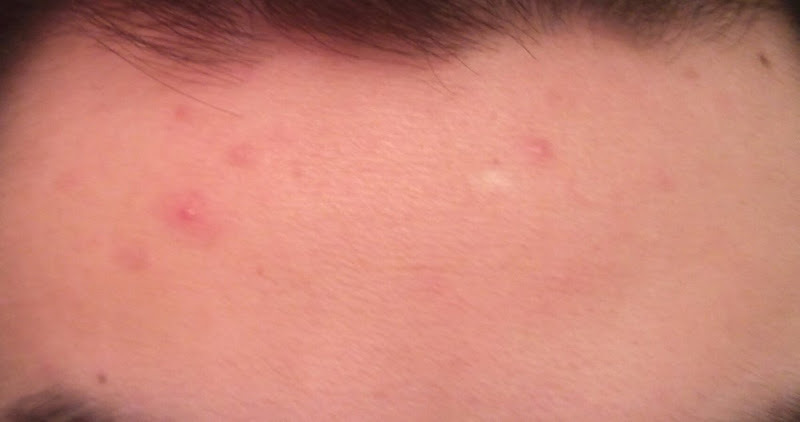 My forehead is not oily at all which is the only positive thing that I can find about this BB cream. If you want a high-end BB cream, I recommend A.H.C. Intense Contour Balm. If you want a more affordable BB cream, I would recommend Skin79 Super Plus BB Cream Triple Function (hot pink) or Missha Perfect Cover. Although I did not like Skin Ceramic BB Cream, I would like to thank Hope In A Blog for hosting the giveaway. Check out their blog if you’re interested in Asian skincare and beauty products. Skin regeneration, wrinkle treatment, oil control, long water, long wear , skin brightening, natural preservatives. Skin Ceramics BB Cream recycles your damaged skin without irritating it. It acts as an anti-wrinkle, anti-pigmentation and increases your skin’s elasticity. It improves your skin’s balance by absorbing sebum and applying moisture. 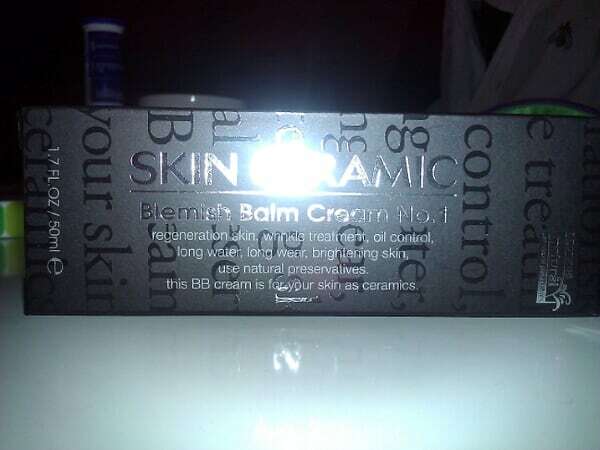 This BB Cream will give you various intensive effects. Soothing, cell regeneration, protecting, hydrating, and acceleration of your blood’s circulation. It normalizes the over production of oil and covers up discoloration of the skin and skin flaws. 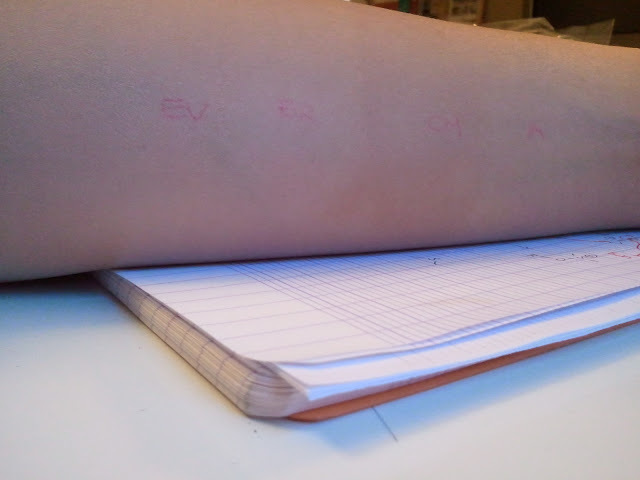 It even evens out reddened skin. This matte BB Cream will leave your skin fresh all day. 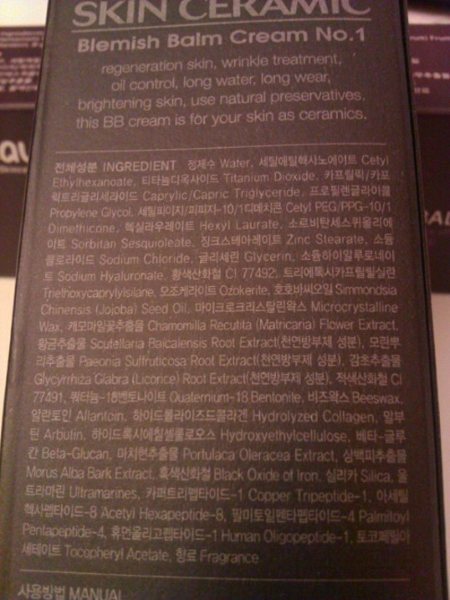 This BB Cream comes in black box with shiny english words on it. The box actually looks very classy, with the Skin Ceramic brand highligted in Silver wordings. Behind the box is the ingredient list in ENGLISH ! 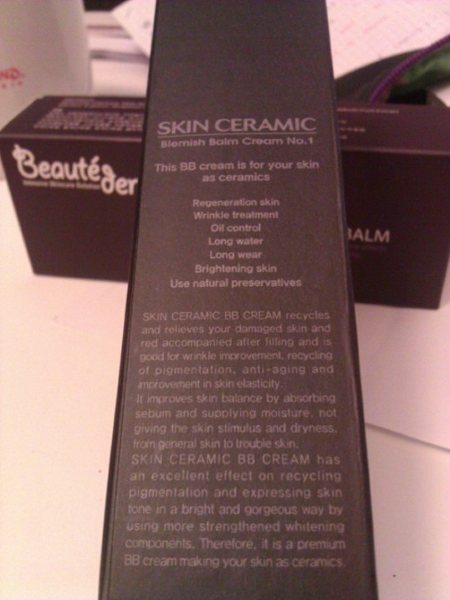 However, the packaging of the BB Cream itself is very simple. 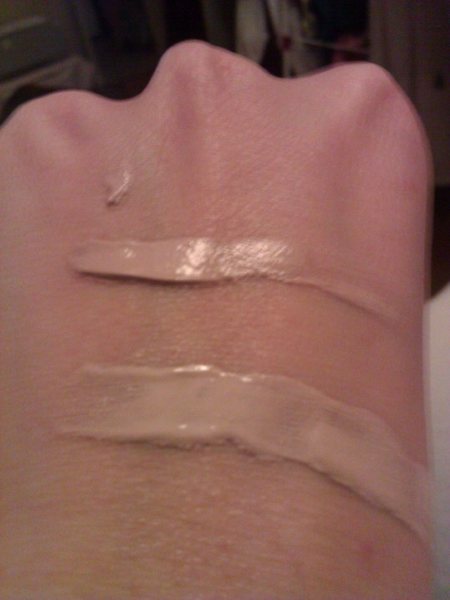 It uses the color of the BB Cream itself and the tube is very much like Hanskins’ BB Creams. The BB Cream comes in a purple box. Nothing special about the packaging here. The ingredient list is listed in English but it is not listed in full, but features only the main ingredients. 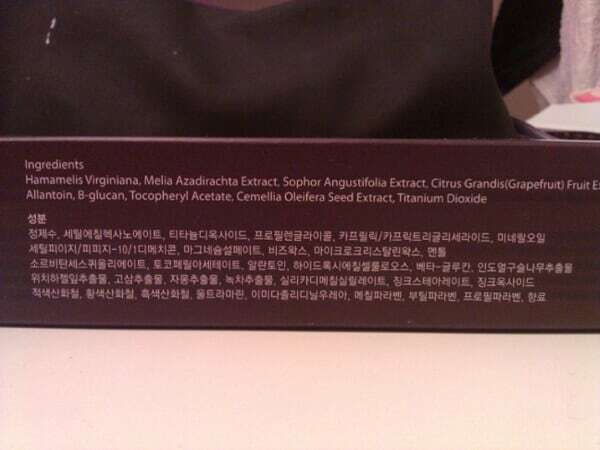 However, the ingredient list in Korean is fully listed. Unlike the Skin Ceramic BB Cream tube which is more flat, the Beaute Derm BB Cream is more bulky and round and less refine. 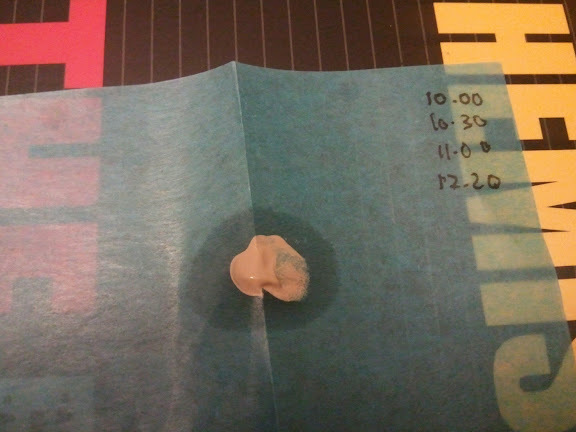 Last picture was taken 8 hours after the 1st picture. 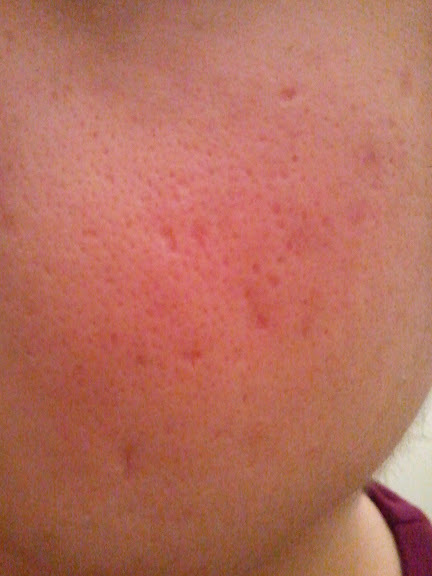 As you can see, the Beaute Derm’s oil control is far more superior than the Skin Ceramic’s BB Cream. 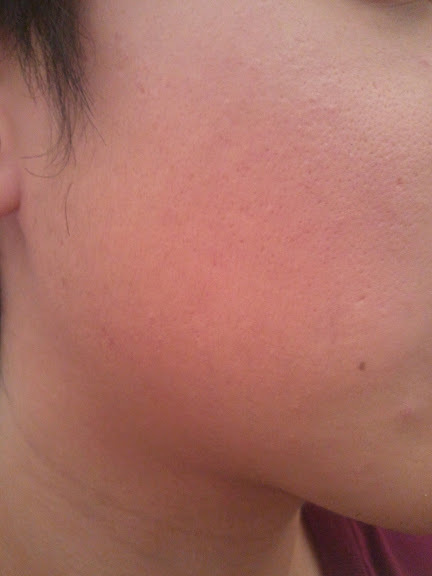 The Beaute Derm BB Cream really does keep your sebum at bay and matte for a very long time! Pretty impressive! 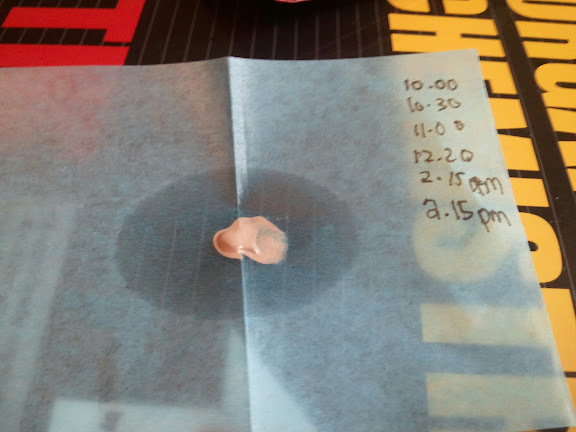 The time in which the photos are taken is written on top of the Skin Ceramic’s oil blot sheet. The Skin Ceramics BB Cream is light in texture and spreads easily. It has also less coverage than the Beaute Derm BB Cream, but it still covers pretty well. We like it’s texture more than the Beaute Derm BB. 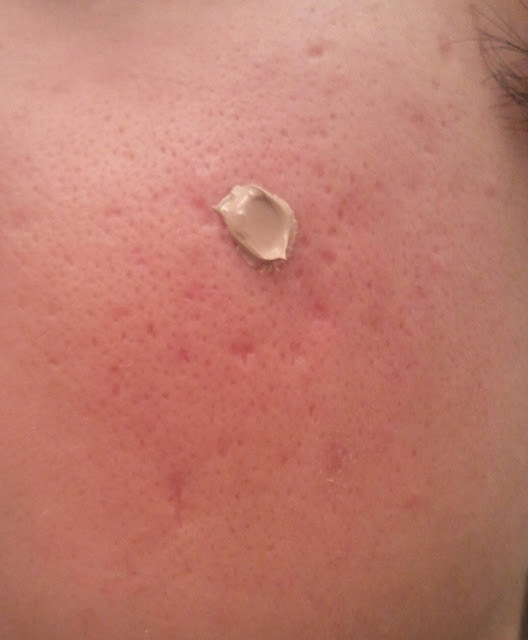 The BeauteDerm BB Cream is thick and dense in texture. It’s coverage is also superior than the Skin Ceramics BB Cream but it is harder to apply and you may need to rub a little harder. Our advice is to pat the BB Creams all over your face instead of applying it with your fingers to achieve a more lighter, natural look. BB Cream isn’t blended properly to the skin. It’s just to give you readers an approximation on it’s colour. The Skin Ceramics BB Cream has a slightly lighter shade compared to Beaute Derm’s BB Cream. However, both of the colour is extremely alike and it’s difference is hardly noticeable. 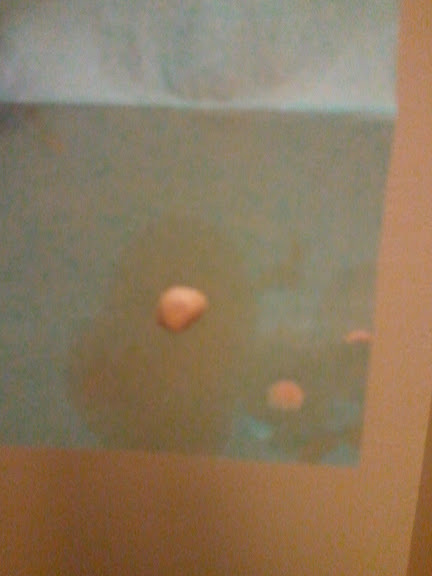 Both of the colours are very natural and has a little pink undertone to it. 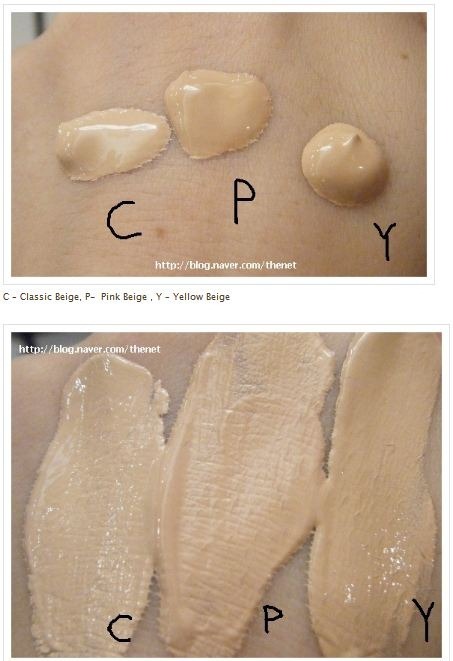 Both BB Creams have some similarities in their ingredients. Both of them have water, cetyl ethylhexanoate, titanium dioxide, caprylic/capric triglyceride, propylene glycol, cetyl PEG / PPG – 10 Dimethicone as their first 6 ingredients. 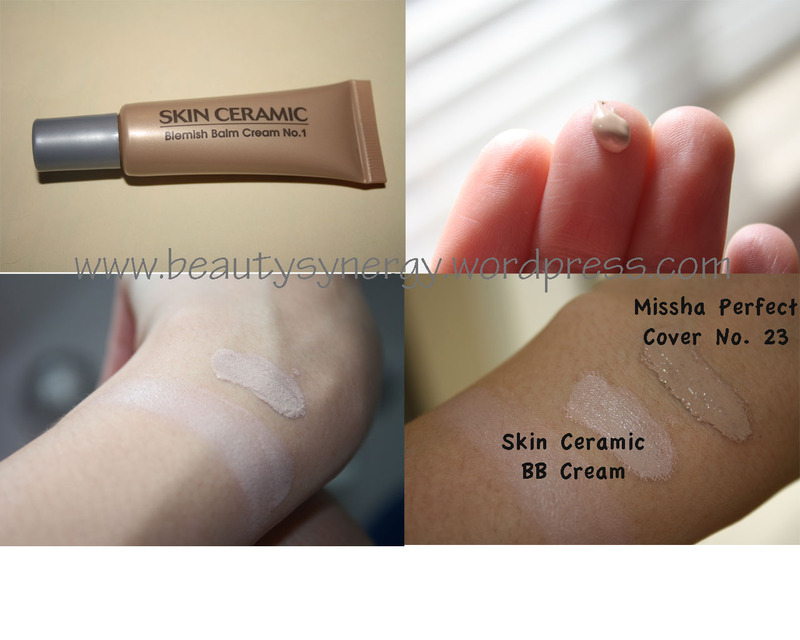 However, Skin Ceramics BB Cream’s ingredients is much more complex than Beaute Derm’s BB Cream. Sorbitan Sesquioleate is used in a variety of products including skin care products, skin cleansing products, moisturizers, eye makeup and other makeup, primarily as an emollient. It is added to formulas as a skin soother and moisturizer and is derived from sorbitol, a humectant. 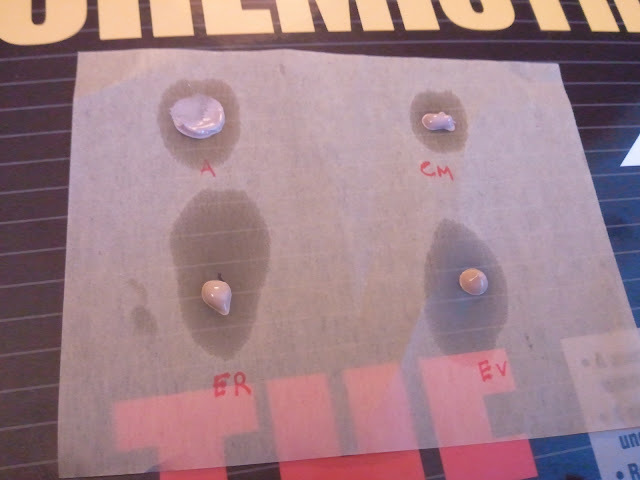 Ozokerite and other waxes thicken lipid (oil) portion of cosmetics and personal care products and help keep emulsions from separating into their oil and liquid components. These waxes lessen the brittleness of stick products and add strength and stability to lipsticks. 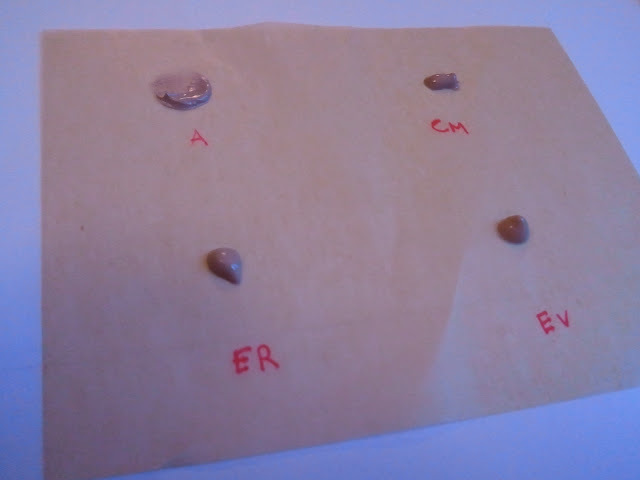 These waxes also hold together the ingredients of a compressed cake. 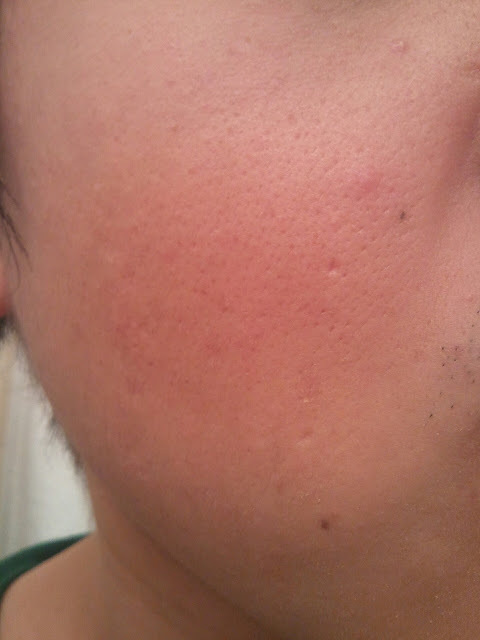 Known as EGF ( Epidermal Growth Factor). It is composed of 53 amino acids and is one of the important growth factors in human body. We spoke of this ingredient in one of the reviews. Also known as Witch Hazel. Commonly used plant extract that can have potent antioxidant properties (Sources: Phytotherapy Research, June 2002, pages 364–367; and Journal of Dermatological Science, July 1995, pages 25–34) and some anti-irritant properties (Source: Skin Pharmacology and Applied Skin Physiology, March-April 2002, pages 125–132). However, witch hazel’s high tannin content (and tannin is a potent antioxidant), can also be irritating when used repeatedly on skin because it constricts blood flow. The bark of the witch hazel plant has higher tannin content than the leaves. Steam distillation for producing witch hazel water removes the tannins, but the plant’s astringent qualities are what most believe give it benefit. Alcohol is added during the distillation process, the amount typically being 14–15%. Known as Neem trea from India. Neem Extract contains Sulfur that is essential building block of collagen, with antiseptic qualities. Aloe Leaf Juice stimulates fibroblast activity and improves the skin healing. Modern science has identified hundreds of active compounds, from various parts of the plant with pesticidal, nematicidal, fungicidal, bactericidal, anti inflammatory, anti-tumor and other properties. These have found applications in the pesticide, medical, healthcare and cosmetic industries all over the world. Environmentally, Neem is known as a natural air purifier, keeping the oxygen level in the atmosphere balanced. Neem’s ability to withstand extreme heat and water pollution is well known. It also helps to improve fertility of the soil and to rehabilitate degraded wastelands. Women have used the healing properties of Neem for centuries in India as part of a herbal beauty tradition. A bath with a decoction of Neem leaves keeps skin supple and healthy. Face packs with Neem leaf powder offer emollient and anti aging action. The antiseptic properties of Neem leaf extract help in controlling acne. 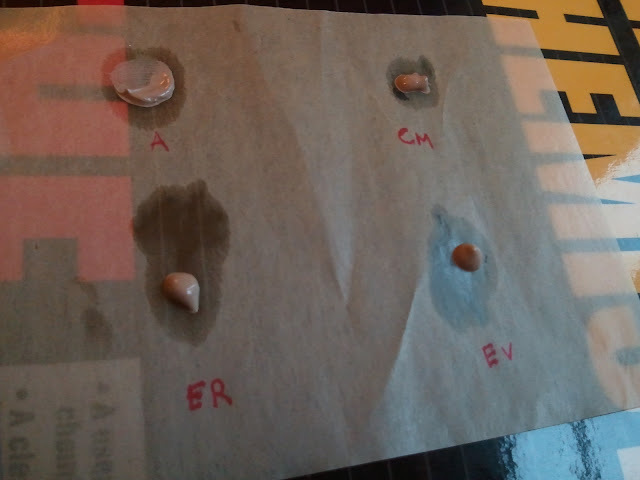 Grapefruit seed extract is being used for many types of external skin conditions from known or unknown causes (fungal, parasites, bacteria, viral, etc). Grapefruit seed extract is a very good facial cleanser for general cleaning of oily skin and is very helpful in fighting acne infections. Used as preservatives in cosmetics. We really like both BB Creams. 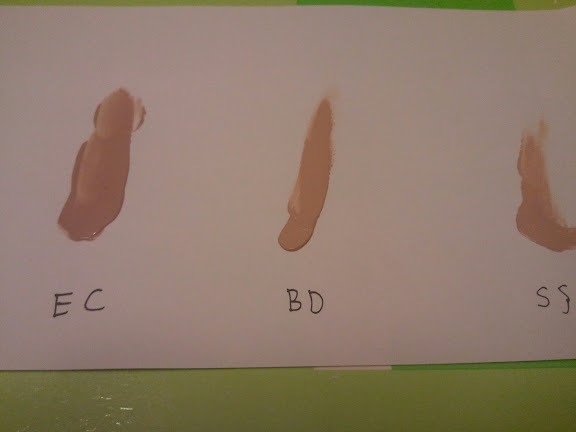 You can tell that these BB Creams are of higher quality and that shows on it’s pricing. How do you pick between the two? 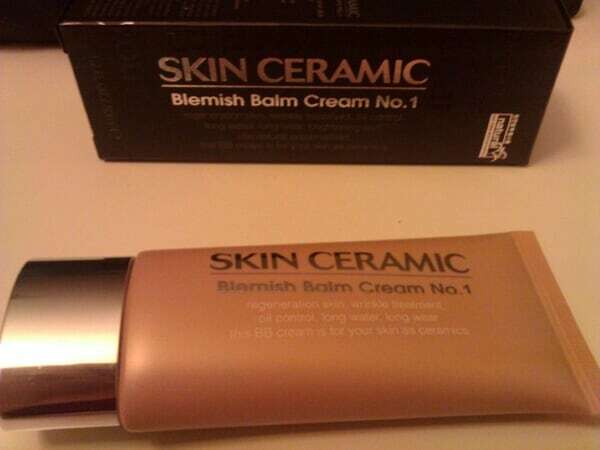 If you have dry to normal skin, go for the Skin Ceramics BB Cream. 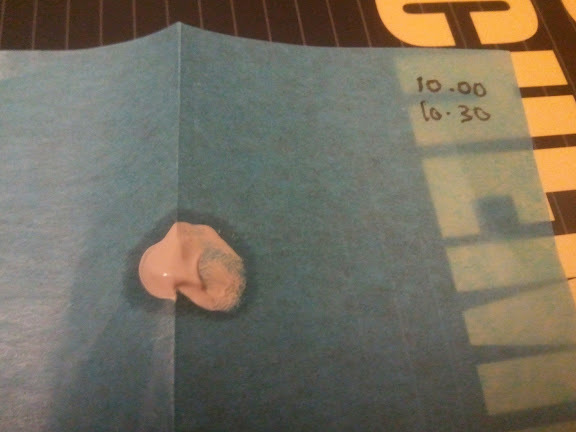 It has a very nice light creamy texture which slides easily on your face. It is also packed with anti-aging, whitening, soothing ingredients and is paraben free. If you want an excellent oil control BB Cream. Beaute Derm BB Cream is really one of the top! It really does help keep your skin matte for 5-6 hours and provides a good coverage. 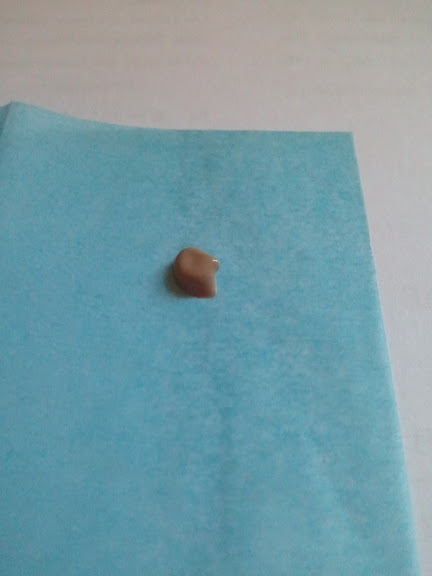 However it’s texture is thicker and more dense. 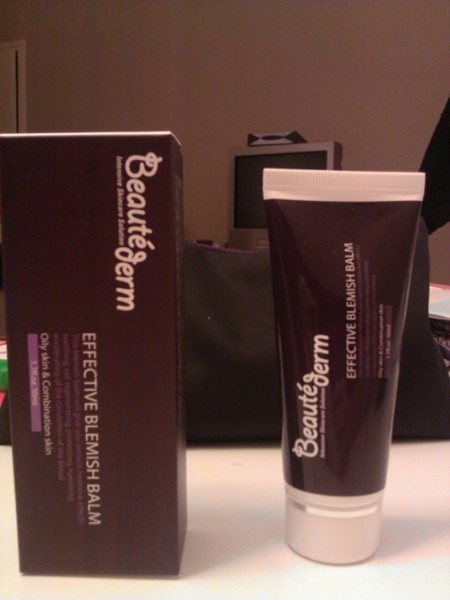 However, the Beaute Derm BB Cream also comes in another version for dry skin. 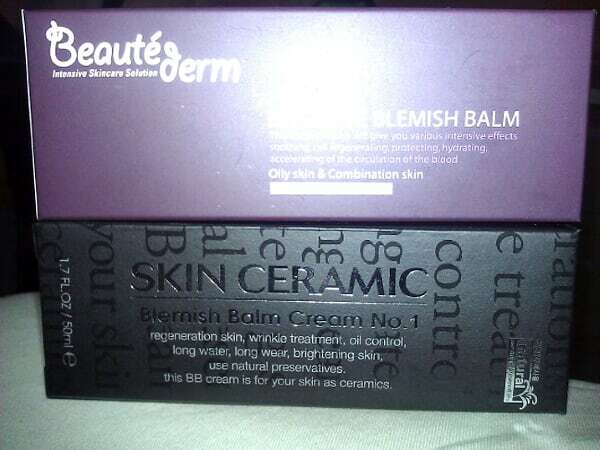 Therefore you’ll have a hard time choosing between the Skin Ceramics and the Beaute Derm BB Cream for dry skin. 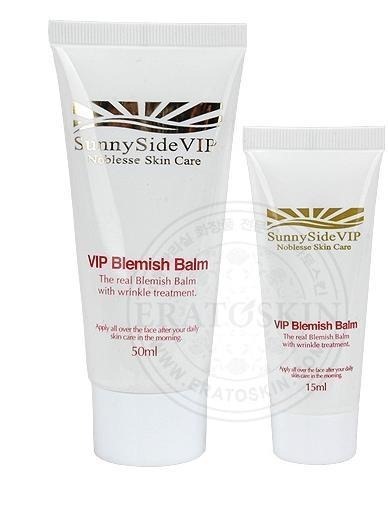 Sunny Side VIP Blemish Balm is also considered one the King of BB Creams. It is VERY well known in Korea for being a very good BB Cream and has a very good reputation among BB Cream lovers – and they have won a few new fans – everyone here at Hope In The Blog loves this BB Cream! VIP Sunny Side BB Cream actively defends skin damage and loss of elasticity of the skin’s tissue. It also calms redness of the skin without irritating it, and moisturizes the skin while repairing it. Like most high end BB Creams like Alexander Kimsco, Dr Schrammek, Forensco, A.H.C who have the ugliest BB Cream packaging around, Sunny Side VIP is also one of them. 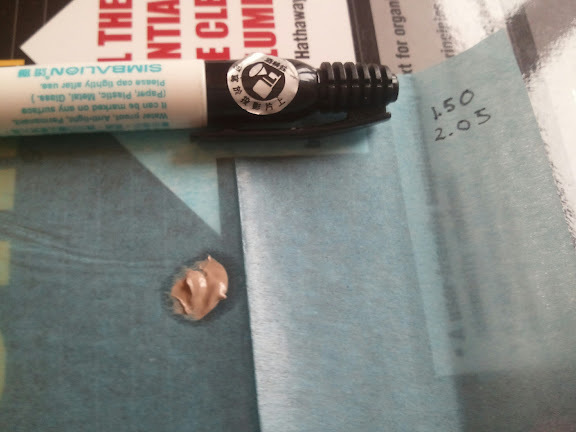 Somehow there is no sense of luxury in the packaging of the BB Cream, nor does it look like one! This is a bit sad as most luxury high end products like the History Of Whoo / Sulwhasoo have very nice posh packaging. More color comparison with the other BB Kings such as Alexander Kimsco etc , look at the Alexander Kimsco review : here! Loves the bright colour of this BB Cream and also it’s rather light texture – makes it easy to deal with! 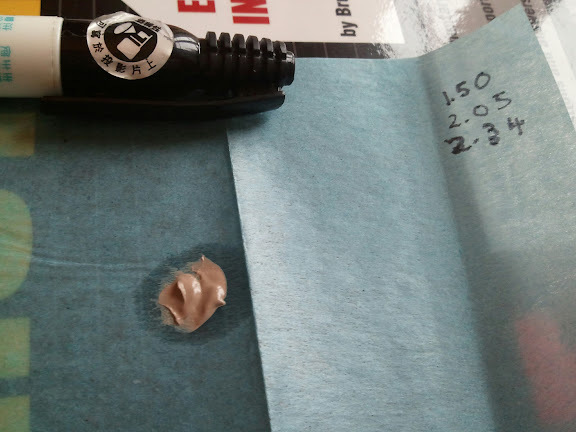 As seen below, the texture is rather light, which makes applying easy! 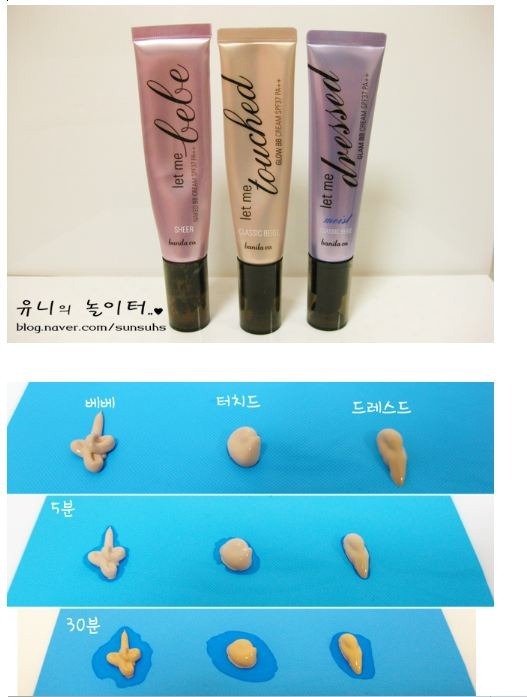 The BB Cream (SS) is being compared to the Elisha Coy Always Nuddy (ES) and the Crazy Monkey Organic BB Cream (CR). 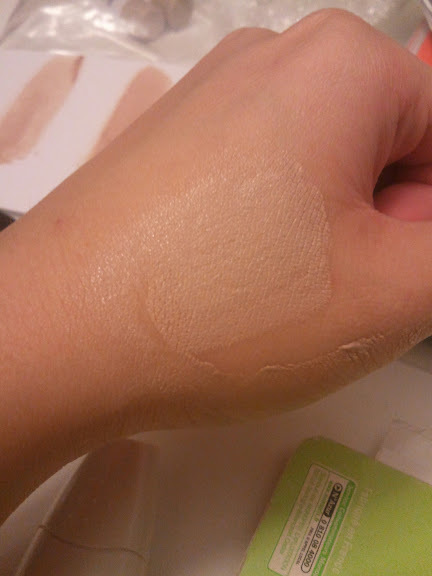 AS you can see, the BB Cream has a bright color and has a pink undertone to it! 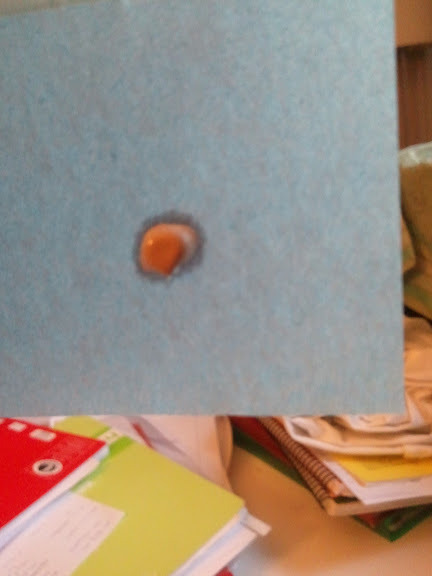 Grey undertone is almost not noticeable at all ! We really like the color of this BB Cream – it brightens up the skin instantly compared to the majority of BB Creams which are greyish and have a dull undertone. This BB Cream definitely lives up to its expectations! 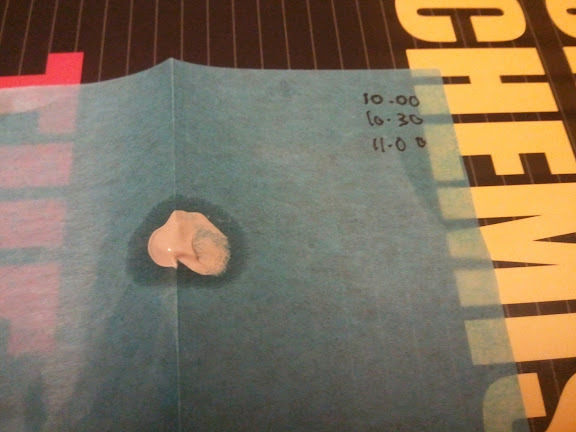 The BeauteDerm BB (BD) also has quite a similar color with the SunnySide (SS) . 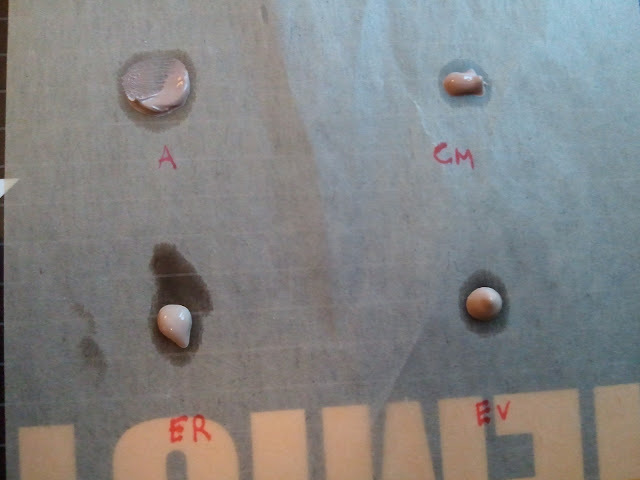 The Elisha Coy Always Nuddy (EC) is darker compared to the other two. 2) B-Glucan – known as Beta Glucan – Polysaccharide, meaning that it is a sugar (e.g., starch and cellulose) that can be derived from yeast. It has some antioxidant properties and is a strong anti-inflammatory agent. They are known to have the ability to activate the immune system. Also, it has been found that B-Glucans can prevent infection and kills pathogenic bacteria. 4) Bisabol – an be extracted from chamomile or derived synthetically. 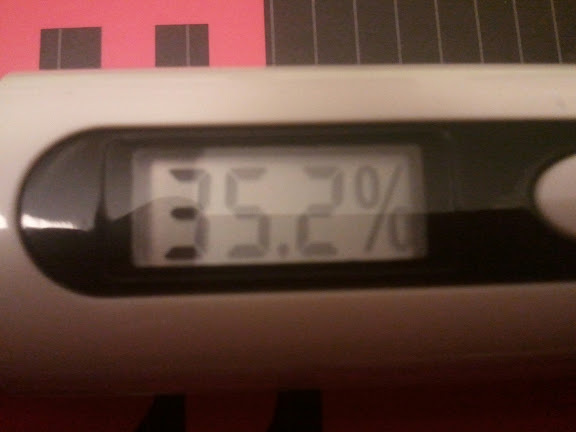 It is an anti-irritant. Calms and relieve skin irritation. 5) Allantoin – Allantoin is present in botanical extracts of the comfrey plant/sugar beet. Skin active ingredient with keratolytic, moisturizing, soothing, anti-irritant properties, promotes the renewal of epidermal cell and accelerates wounds healing. 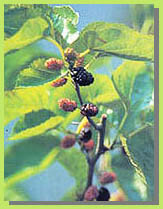 6) Morus Alba Leaf Extract – known as white mulberry plant. 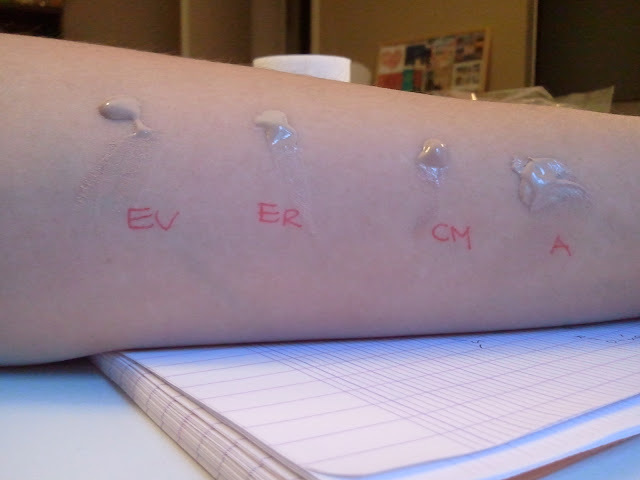 Quantitative Analysis of Rutin, a Flavonoid Compound in the Leaves of m Morus alba: Rutin showed to be an inhibitory of melanoma (melanin) growth, anti-tyrosinase and antioxidant suggesting a potential for dietary supplements or cosmetic applications, therefore giving the skin a whitening effect. 7) Deep Ocean Water – is the name for cold, salty water found deep below the surface of Earth’s oceans. Ocean water differs in temperature and salinity, with warm, relatively non-salty water found at the surface, and very cold salty water found deeper below the surface layer. It is rich in minerals. Oil control is rather good here – almost comparable with the Alexander Kimsco , i have no complains! 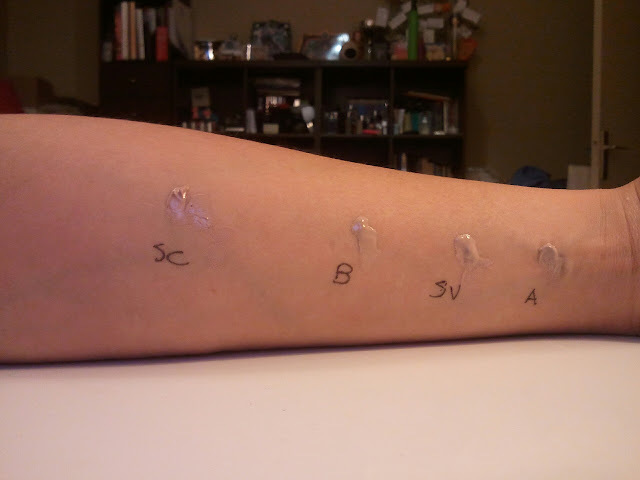 Refer to the Alexander Kimsco Review for oil control comparison with other BB Creams. 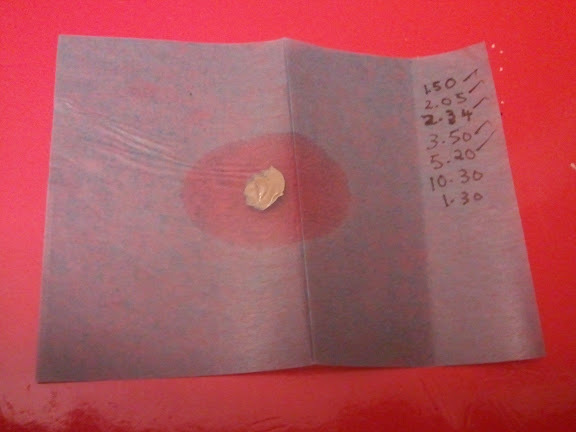 Time is recorded on the right of the Blotting paper! It does give a slight glow, dewy finish, which looks very natural! 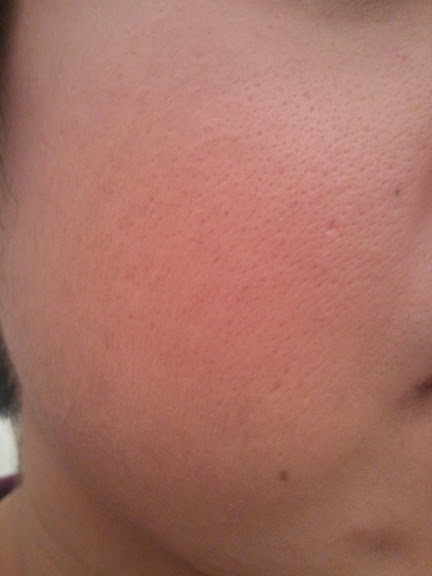 Left side has a dewy glow to it after BB Cream was applied, right side nothing was applied! Priced at 120,000 Korean Won for 50ml (slightly cheaper than Alexander Kimsco) , this BB Cream performs better than the Alexander Kimsco BB Cream. Infact, we loved this BB Cream so much and it has quickly became a favourite. Would we purchase the full size tube? Definitely. If we were going to be stranded in an island and allowed to bring only ONE BB Cream – this would be it ! We loved everything from the color, undertone, texture of it, the dewy glow it gives. Not to mention its super ingredients! Should you purchase it? If you have some extra money and have always wanted to invest in a luxury BB Cream – why not? Share your experience here if you have tried this BB Cream. Funny why this BB Cream isn’t famous outside Korea because it really is a very good BB Cream. The reason is probably because there isn’t any distributors outside Korea, and also because of its steep price! The downside of this BB Cream is that there isn’t any SPF included! If not, this would be the holy grail of all BB Creams! Purchase this on Gmarket on Sunnyside’s Official Gmarket Page! There is currently a promotion for Sunny Side VIP BB Cream – 190,000 Wons if you buy 2 tubes of 50ml. Alexander Kimsco is the KING of all BB Creams. It was also one of the first BB Creams that hit the market ( after Schrammek’s BB Cream ). 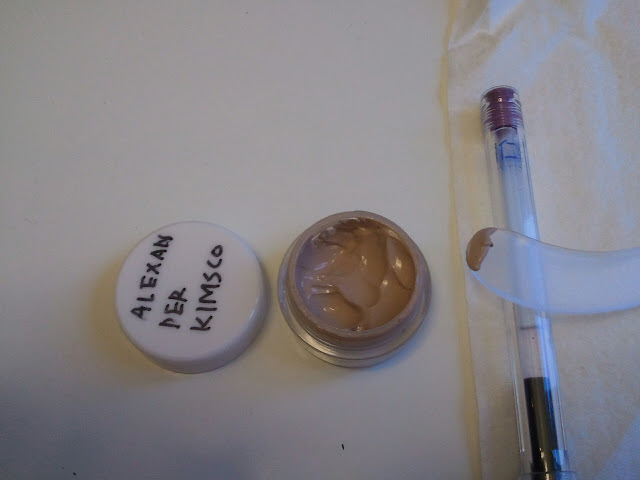 After the success of Schrammek’s Blemish Balm, other german cosmetic companies also launched their own BB Cream, and Alexander Kimsco was one of them. In 1990, Alexander Kimsco establied a subsidiary in Korea and released their First BB Cream. That BB Cream that made Alexander Kimsco a household name was their ‘BmB Blemish Balm’ . In 2009, they released a new BB Cream called the Alexander Kimsco Ceramide BB Cream ( which will be reviewed ). First of all, let us understand the name behind this BB Cream. What exactly are ceramides? Scientists are uncovering the important role that ceramides play in the barrier function of the skin. 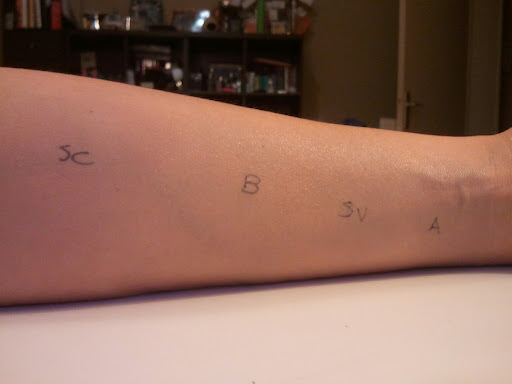 The top layer of the skin is the epidermis, and the top layer of the epidermis is thestratum corneum (SC). 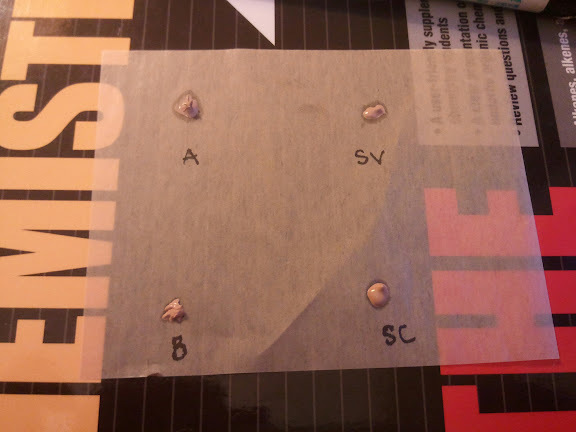 Even though the SC is very thin — 10-30 mm or one-tenth the thickness of a piece of paper — it is the main barrier of the skin. It keeps chemicals that come in contact with the skin from absorbing into the body, and it keeps water inside the skin from leaching out. The SC contains three types of lipids — ceramides, cholesterol and free fatty acids. These lipids have different chemical compositions and different functions throughout the body. There are nine different types of ceramides in the SC, conveniently named ceramide 1 through ceramide 9, and they account for 40-50% of the lipids in this outermost layer. 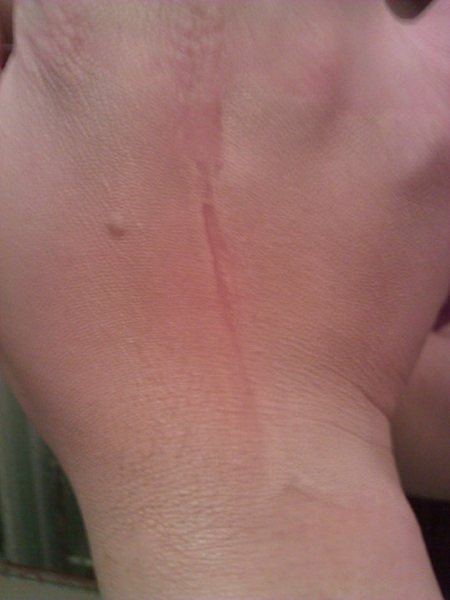 Scientists have learned that people who have eczema have significantly fewer ceramides in their SC. On the other hand, people with psoriasis(another itchy, flaky rash sometimes confused with eczema) have the same number of ceramides compared to people with normal skin. 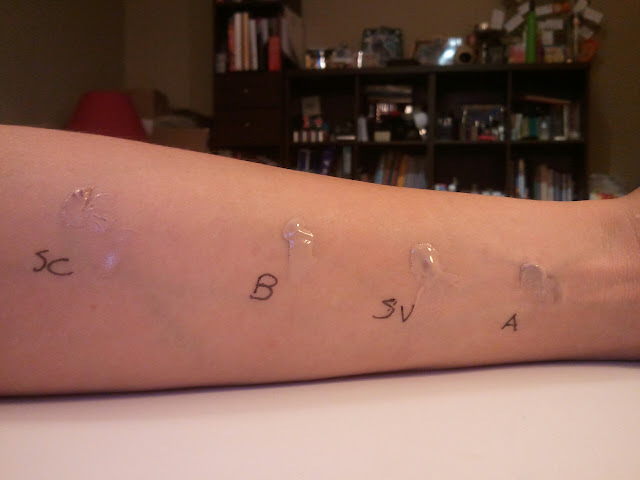 Recent studies have shown that lipids can be replaced with topical preparations. Interestingly, all three lipids have to be replaced at a certain ratio to restore the barrier function of the skin. If the incorrect balance of lipids is applied, it actually takes longer for the skin to heal. 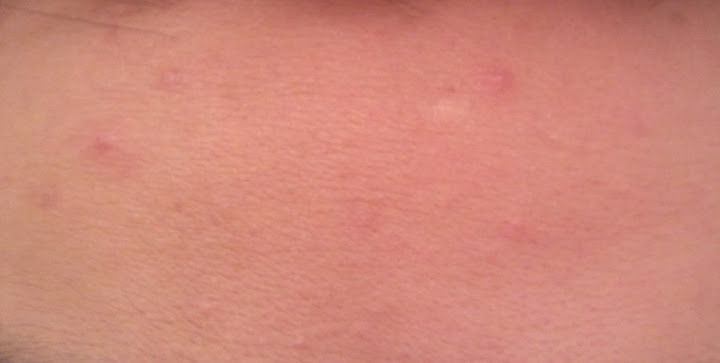 The healing effect of ceramides has been studied in eczema, but there are no studies yet for psoriasis. That is what Alexander Kimso’s Ceramide BB Cream is all about. As BB Creams was firstly used for those who has undergone cosmetic treatments ( such as laser peel, etc) and for those with skin problems such as eczema – therefore, it is only natural that Ceramides was used as the main ingredient here. The Ceramide BB Cream helps keep moisture in the skin and contains the same balance of lipids as your skin. 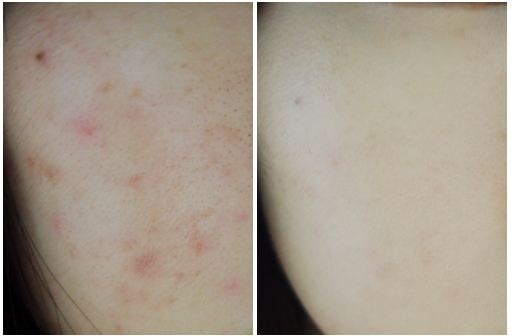 Ceramide moisturises are extremely useful to treat eczema, but they can be used by anyone with dry skin. 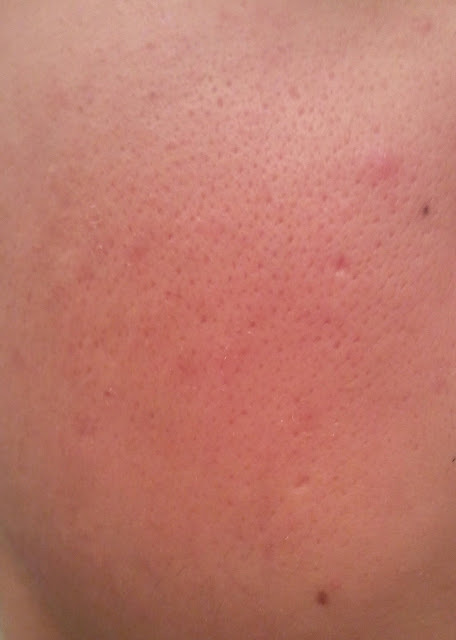 To read more on moisturisers with Ceramides, click here ! As i was given a 5ml sample, i cannot comment on the packaging, but here it is how it looks like : comes in a simple 50ml tube. It is really sad to say that the packaging isn’t appealing at all. In fact, the european-made BB Creams such as Schrammek, Alexander Kimsco, etc have the ugliest BB Cream packaging in the world and cannot be compared to their Asian counterpart. The packaging isn’t desirable at all and makes it seem like a cheap product! 1) Ceramide – please refer to the What Are Ceramides section above. 2) Licorice Extract – from the Licorice Plant known also as sweetwood and black sugar since the extract is very sweet. As an herbal supplement, licorice extract is said to boost the immune system, aid in the function of antioxidants. It also has anti-inflammatory properties. 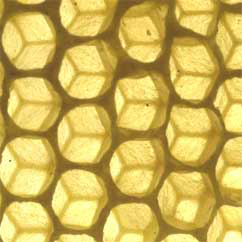 3) Cera Alba – also known as Beeswax. It helps as binder when manufacturing and also helps withstabilizing the emulsion when combining water and oil based products while conditioning the skin and thickening the mixture. The inclusion of beeswax in a formula does NOT make the product tacky or oily – but helps to create a very luxurious “feel” to the product. It is classified as a binder, emulsion stabilizer, fragrance ingredient, skin conditioning agent (miscellaneous), surfactant (emulsifying agent) and a viscosity increasing agent and chemically classed as a wax. 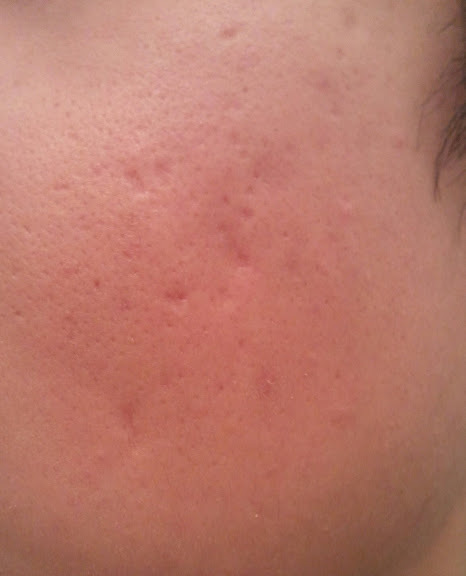 The texture here is rather unique, i have not felt such texture before with any BB Creams or even Creams. My guess is that it is probably due to the ceramides? It leaves a matte feeling on your skin and does not feel oily at all. However i do feel that this is a love-it or hate-it texture. Personally, i felt weird initially because i’ve never felt such texture/feeling before, but i came to like it after a few uses. It feels like the cream creates a barrier over the skin , and doesn’t feel like the slippery smooth feeling that most BB Creams have ( which is due to silicones ). However, this cream will not give you that moist feeling and those with very dry skin will definitely need to apply some cream before the BB Cream. For those with oily skin, you will probably be happy with it’s texture. The BB Cream looks very creamy and rich in texture, but it isn’t quite the case once applied to skin as it doesn’t give that rich feeling that it seems to have. It also needs a little rub when applying to your skin due to it’s creamy thick texture. Colour wise , this BB Cream is very natural. 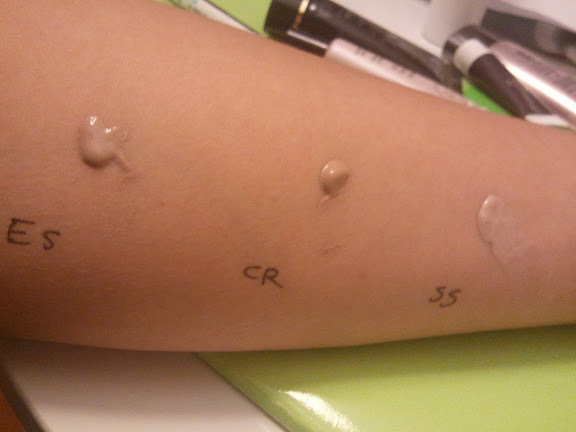 It is actually one of the more natural colours i’ve seen in BB Creams. However, this BB Cream did give me a shock when i applied it for the first time because the greyish tone was very heavy and my skin looked so dull and ‘ash-ified’. 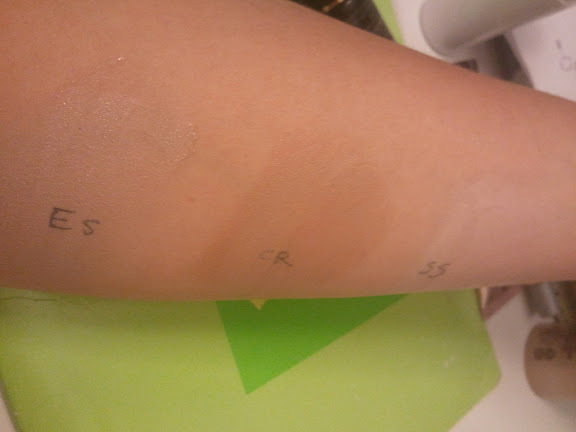 However, i found out what the problem was – i was suppose to wait for a few minutes to let the BB Cream sink into my skin and blend with my skin tone ( which applies to ALL BB Creams! ). 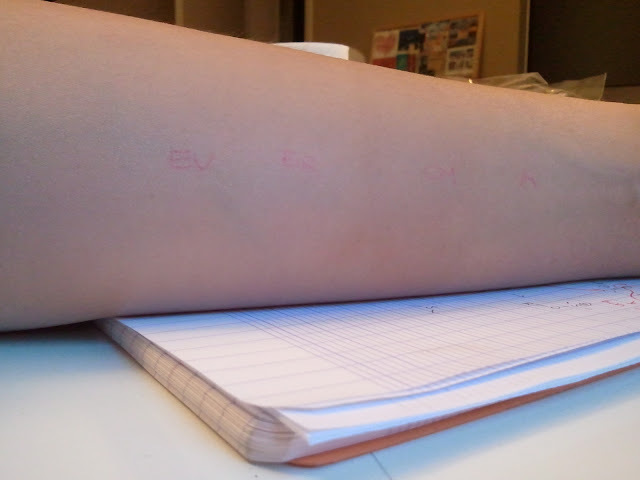 After a few minutes, it gave a very natural look. 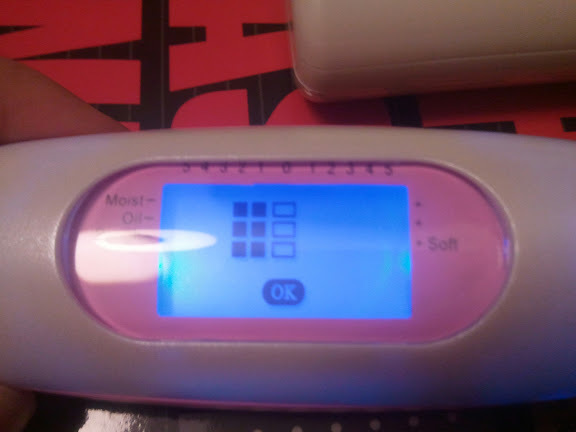 The coverage for this product isn’t very good. Although it is an excellent skin camouflage because of it’s very natural colour, it sadly lacks in coverage. Those of you with big pores, scars will have to cover it with something else, but this BB Cream serves as an excellent make up base because it keeps your skin matte and helps protect from loss of moisture. One word to describe : FANTASTIC! This BB Cream has one of the best oil-controlling properties i’ve come across on any BB Creams. It’s perfect for those with oily skin. 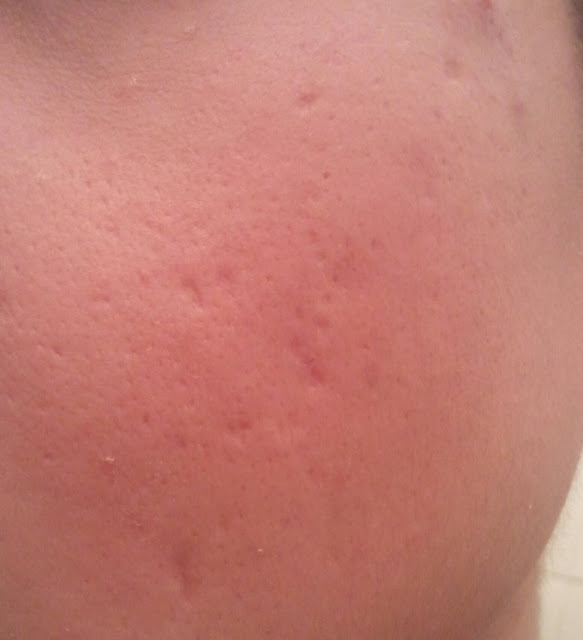 After 8 hours, my skin doesn’t feel very oily, and feels very comfortable! 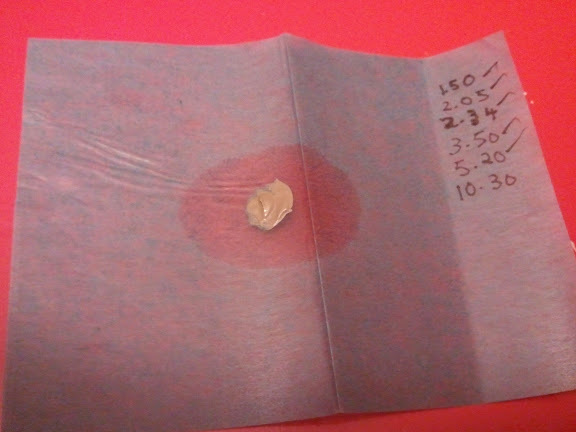 The time when the photo was taken is noted on the blotting paper itself on the right. Incredible isn’t it? 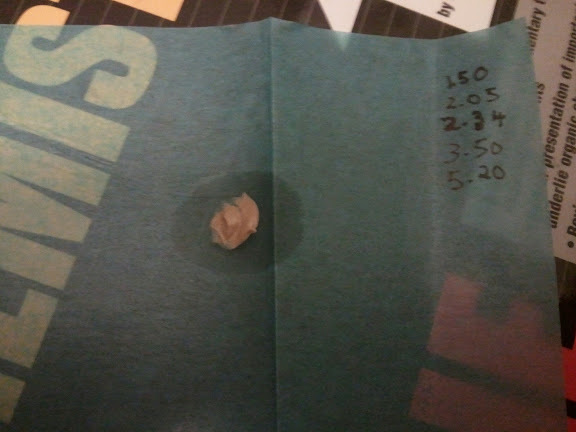 Even after 12 hours, the oil doesnt even cover 1/4 of the blotting paper! The question is now : Is it worth spending $100 on this BB Cream? Is it even worth $100? My answer is sadly No. While i’m satisfied with this BB Cream, i do feel that it’s price is too steep for a BB Cream. One can easily find another BB Cream that does the same job for much less! However, i believe that the steep price is due to the high-quality natural ingredients that was used to make this BB Cream. Ceramide itself is a rather expensive ingredient. However, i would purchase a sample size of it on days when i need to look fabulously naturally ! While i do love it’s very natural color ( and hates its very greyish base it gives on first few minutes of application ) , i have to say it has one of the best oil controlling properties. The BB Cream is also very comfortable to use and doesn’t dry up your skin, nor does it make it oily. 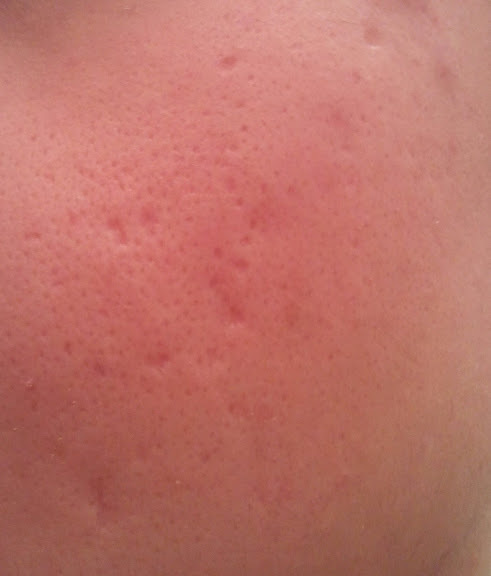 When applied, you will feel that there is some kind of a ‘barrier’ on your skin. On the coverage side, it is average. Those with no skin problems would find this enough, but those who wants more coverage should skip this product, or use it as a make-up base. For it’s moisturizing properties, those with dry skin would definitely need to apply their usual cream before this BB Cream. For those living in countries where it’s summer all year long, this might do just enough! And for those with oily skin, you definitely just need to apply this to your face and skip the moisturizer! 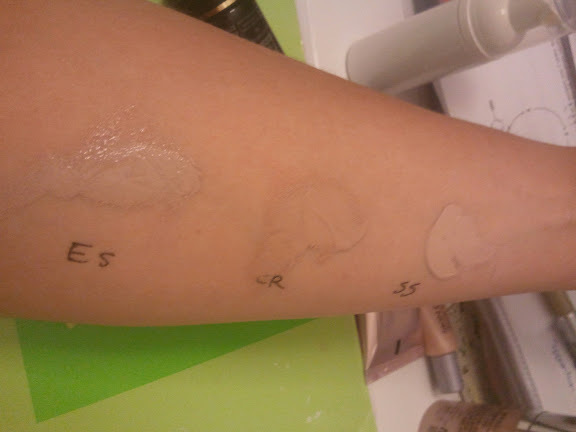 Let Me Bebe has 3 options to it .It is the most basic of the 3 BB Creams and has the lightest coverage. It has SPF 37 packed into it. And lastly, you have the Let Me Bebe luminous, which has shimmers and glitters on it to give you a superstar look! 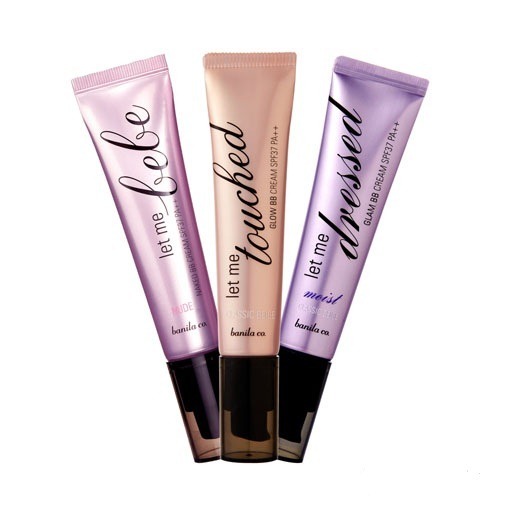 Let Me Touched is the 2nd of the BB Series and gives a slighty better/heavier coverage than the Let Me Bebe Naked. Like the Let Me Bebe, it also contains SPF 37. It also gives a subtle glow and shine to your face. It comes in three different shades. Let Me Dressed Glow is their latest BB Cream, It is said to give the best coverage out of the three BB Creams,and on top of it, it offers 12 options ! Wow ! For this BB Cream, there are 4 colors to choose from, and for each color, we are able to choose from two formulation – one for dry skin (MOIST) , and the other for oily skin (MATTE) . Banila Co has really spoilt their fans with this as no BB company has offered this much option before. It also contains SPF 37 like the other two BB range. 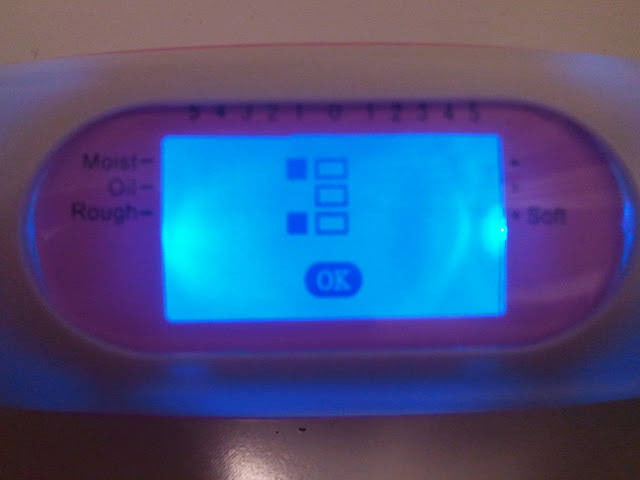 Left to Right : Bebe, Touched, Dressed. 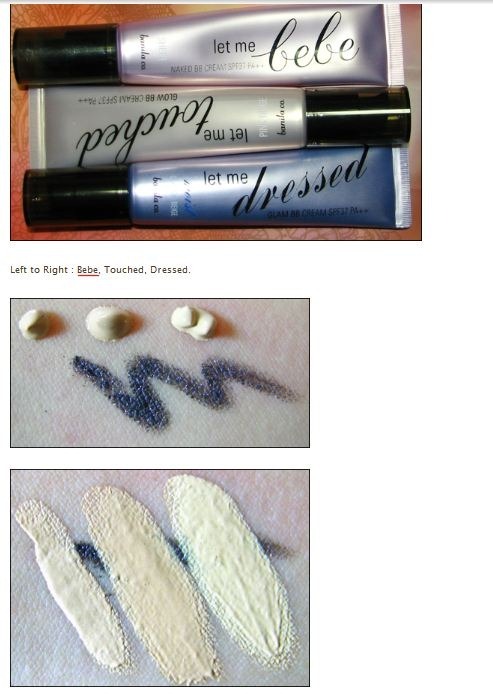 You can see the coverage difference : Let Me Dressed has the heaviest coverage compared to the Let Me Bebe. 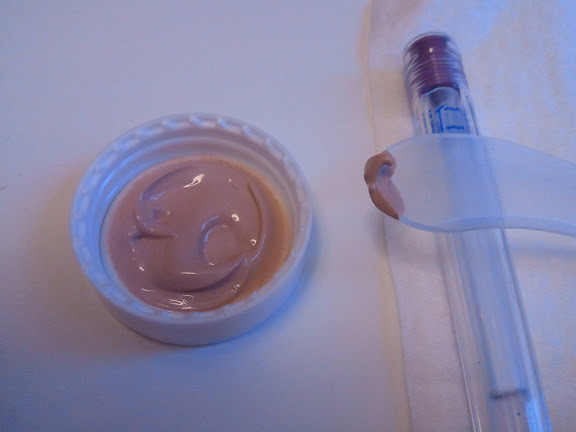 This is a basic BB Cream from the Enprani Group. It was their first BB Cream , but it’s popularity faded when Enprani came out with their best-selling BB Cream – “ All That B.B “ . To know how old and basic this BB Cream is, you will need to know that it doesn’t even contain any SPF. Almost all the new generation of BB Creams contains SPF nowadays. 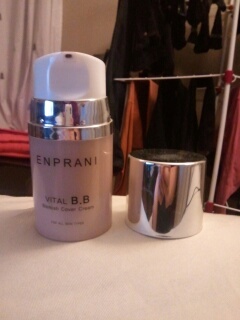 The Enprani Vital BB Cream comes in a very nice glossy black box. The BB Cream is stored in a little bulky pump. It is really cute in a way, but maybe inconvenient for you ladies to bring it out with you since it’s really bulky! 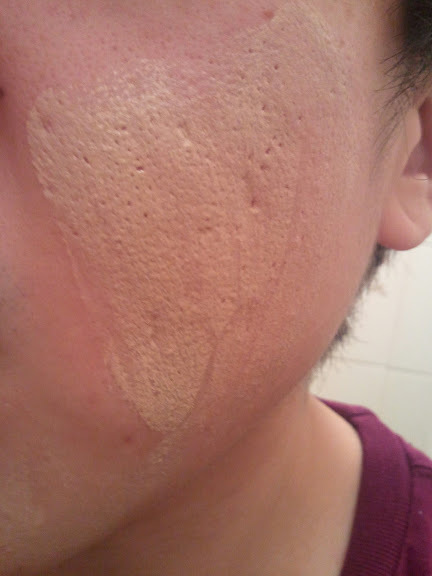 The pump is also rather hard to control so sometimes we pump too much BB Cream out! According to Wiki, Bradykinn is a peptide that causes blood vessels to dilate (enlarge), and therefore causes blood pressure to lower .Bradykinin is an inflammatory nonapeptide (9- amino acid peptide chain) originating in the plasma So why is it used in cosmetics? 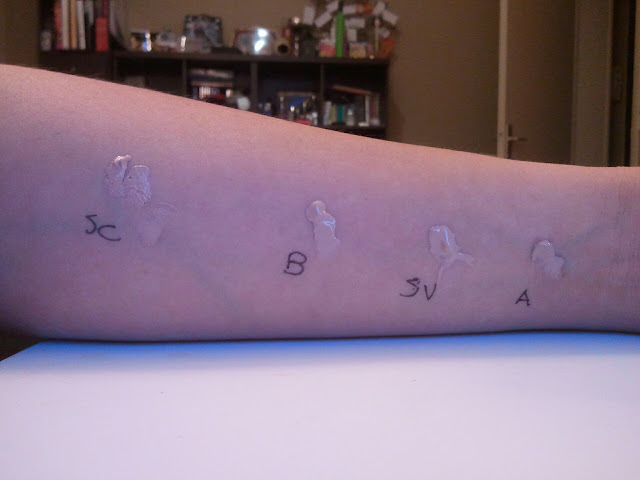 It has now been determined that one of the essential characteristics of sensitive skin (reactions of skin irritation and intolerance) are associated, in particular, with the release of these neuropeptides, induced by bradykinin. 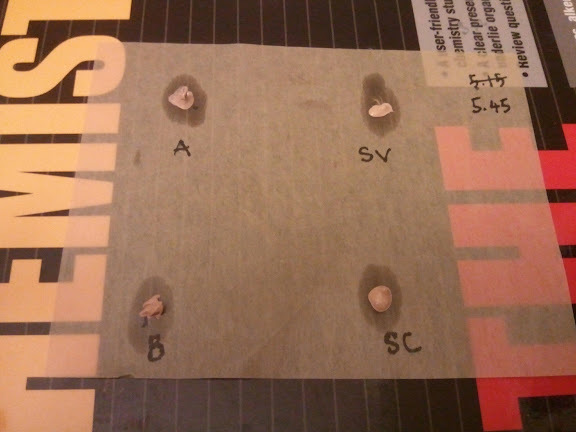 Thus, it has now been determined that the use of a bradykinin antagonist permits the preventive and/or curative therapeutic treatment of sensitive skinTo treat sensitive skin, bradykinin antagonists are hereby employed. Indeed, it has now surprisingly been found that the formulation of bradykinin antagonists into a cosmetic, pharmaceutical or dermatological composition avoids the irritationand/or dysaesthesic sensations in and/or pruritus of the skin and/or of the mucous membranes. Briefly, the present invention features the formulation of at least one bradykinin antagonist into topically applicable compositions comprising a cosmetically, pharmaceutically or dermatologically acceptable medium, for treating sensitive skin. To read more : head over here and here ! The Enprani Vital has a nice rather light texture to it. 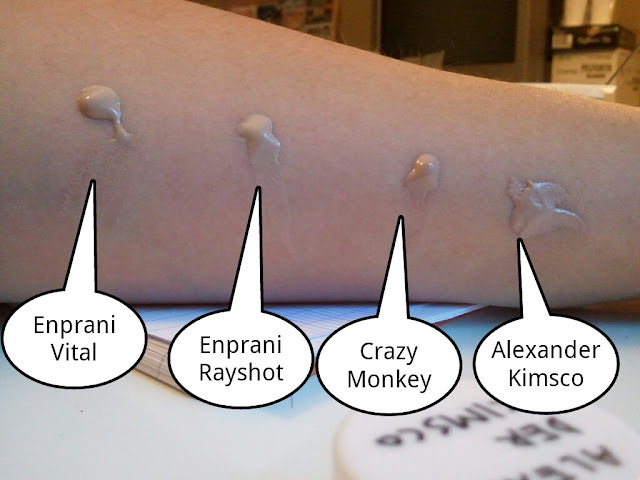 In a way it is also rather creamy, and compared to the Enprani Rayshot it is creamier and thicker in texture. 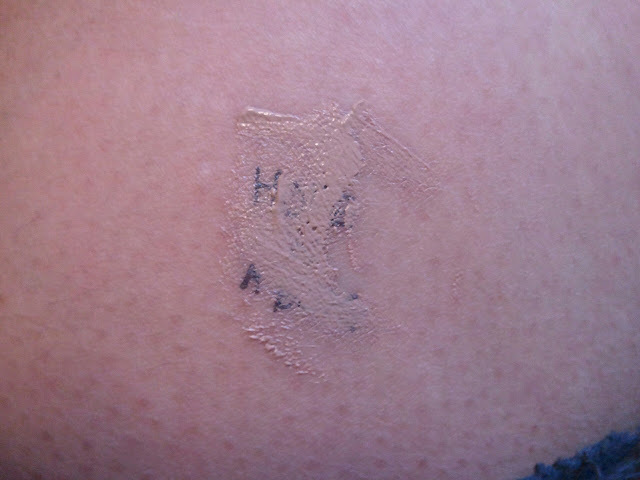 It is also very easy to spread on the skin and has a greasy texture to it! 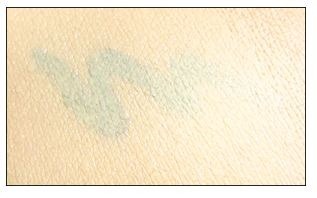 As seen below, Enprani Vital has a darker color compared to the rest, but don’t worry, once applied to the skin, it blends with the skin color. 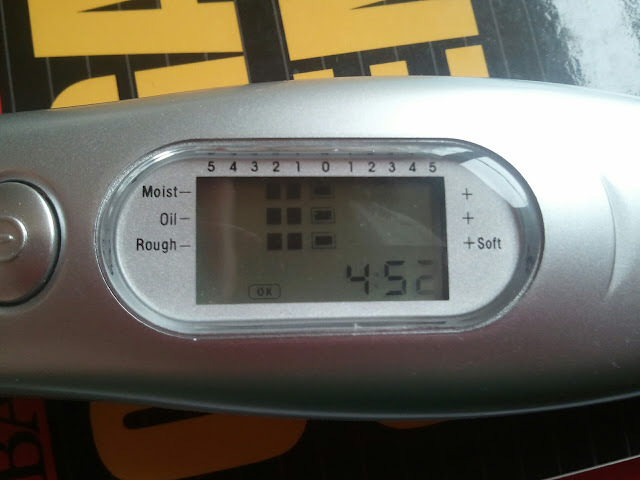 Oil Control is rather poor for the Enprani Vital BB Cream. 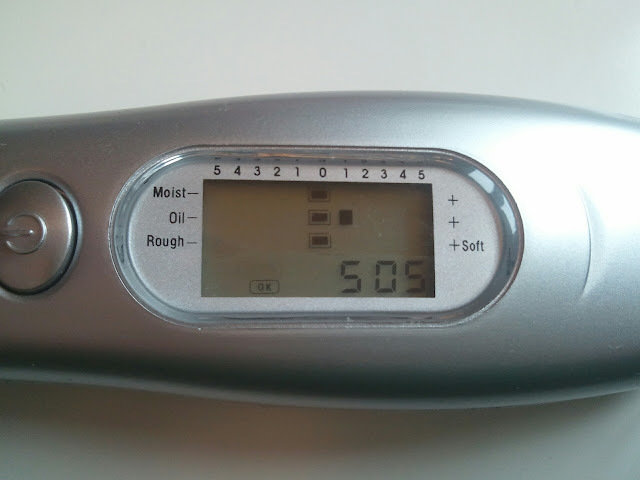 However, it would be suitable for those with combination – combination dry skin. 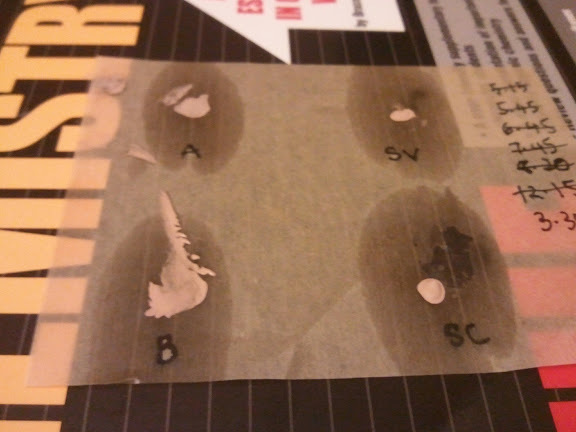 Picture taken after an hour : As you can see the paper blot is already very oily even after only 1 hour! 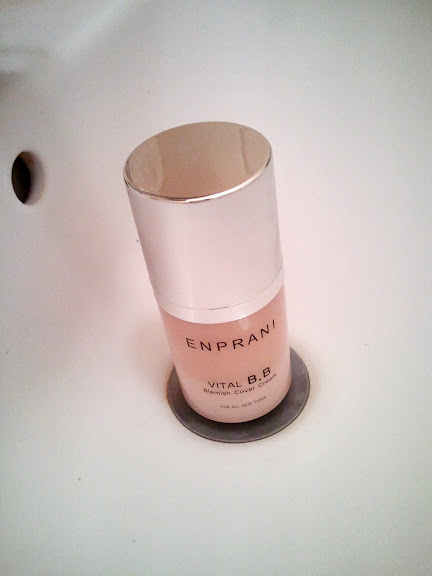 Before putting on Enprani Vital : –1 for both Skin Texture and Moisture. 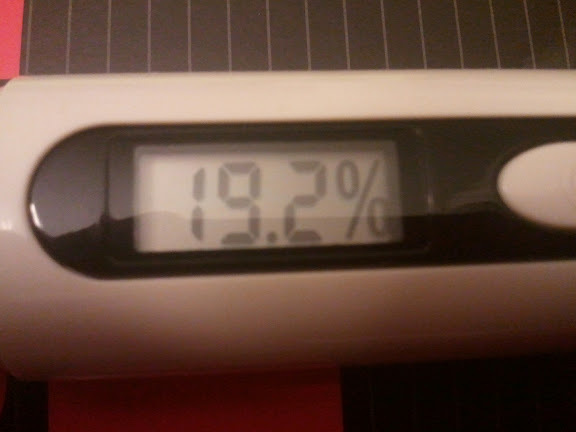 Normal for Oiliness. 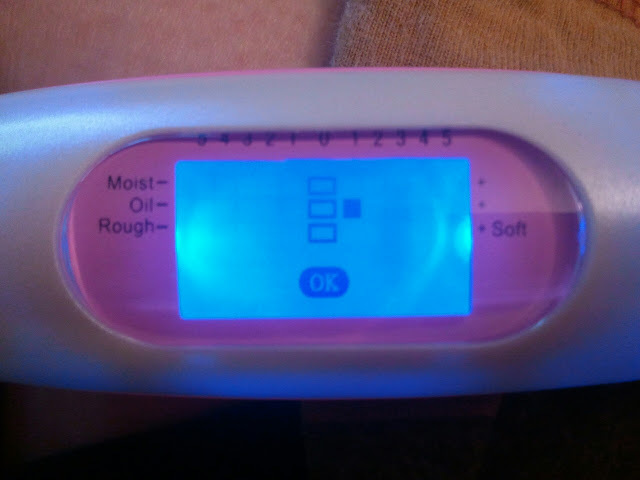 After putting on Enprani Vital : + 1 for oiliness, moisture, and texture. This BB Cream has an average coverage. 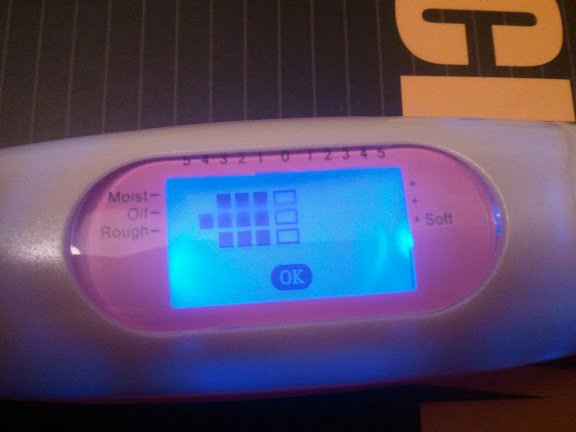 It will cover well if you do no not have much skin problems. And on my right cheek which is much better ! As said in the introduction, this is a very basic BB cream. 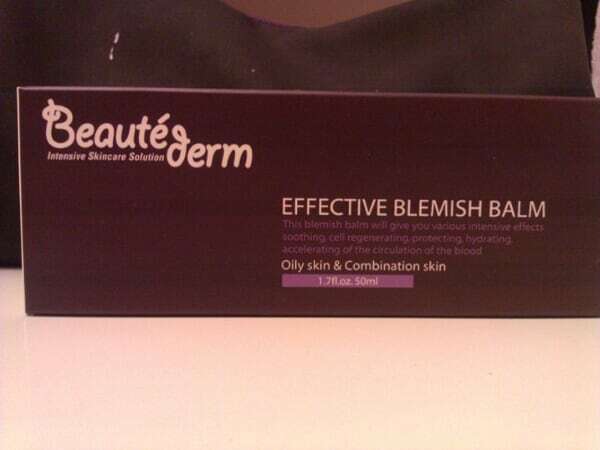 It does it job like all BB Creams, and is more suitable for those with drier skin. It does have a good staying power though. It doesn’t have sunscreen so you have to apply another layer of sunscreen before applying the BB cream. Like all Korean cosmetics , it has fragrance in it, and thank god, it isn’t heavily scented ! Repurchase? Probably not… there are so much other options. However if you are looking for a cheap BB Cream as a base, or just as a light coverage for night use ( as u don’t need sunscreen at night – when you need to go to the mamak with friends etc ) this BB cream could be an option. Enter your email address to subscribe to Hope In A Blog and receive notifications of new posts by email. 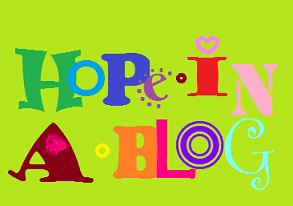 Readers who don't have a personal blog and too lazy to create one, but who wants to share their personal review on products to share with other beauty-lovers are also welcome to submit your reviews at hopeinablog@gmail.com. 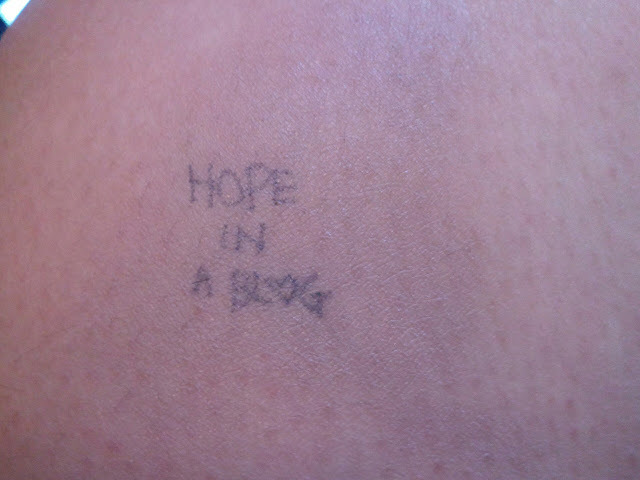 Hope In A Blog is based in Paris, France. Who’s been talking lately ? Subscribe To Our Blog Via Wikio !